Part of the remodel we are doing in Nelson calls for a covered deck with a curved roof. Using a solid timber to create this beam would have required an enormous old growth tree and lots of cut off waste, so we used a different strategy to mitigate waste and achieve the complex curve. 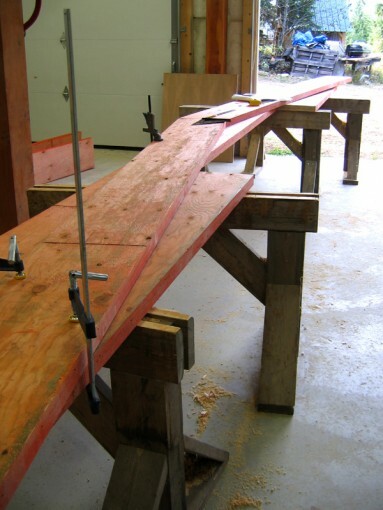 We created the beam using three layers of 12″ x 1 3/4″ LVLs (Laminated Veneer Lumber). We were able to use seven shorter sections pieced together to reduce the amount of waste during cutting. Screws and LePage Green Series (low VOC) subfloor & deck adhesive were used to laminate the sections together.